The Contrapel Hybrid is truly a revolution. Fundamentally it’s a propeller system, with all the advantages of a water-jet. This results in high propulsive thrust at all speeds. Maximizing the mass and minimizing the velocity of the plume ensures efficient usable thrust below 25 knots. Boats are great when the sun’s out and there is no wind. They are able to plane and manoeuvre with impunity within optimal design parameters, however bad weather with high sea-states (waves) strong winds and currents, flotsam and jetsam, unknown depths or submerged objects, can each conspire to force the propulsor to be operated outside the manufacturer’s recommendations. Boating is pretty safe generally, provided the skipper is competent and the boat is well maintained. However when conditions change, or an unexpected event occurs, things can deteriorate very rapidly. Boats are often evaluated in magazines according to how fast they can go. Unfortunately the more important consideration is often ignored. How well a propulsor performs at low speed when conditions are poor, can mean the difference between life and death. Some high-speed propellers, water-jets, surface-piercing and super-cavitating propellers may perform extremely well above 20 knots, however below that they have low propulsive thrusting characteristics. Commercial operators know this only too well, as they are required to operate in every conceivable condition. Pleasure boaters however often do not find this out until they are confronted with an unexpected event. An unforeseen storm, or a miscalculation of depth, or even just plain bad luck can quickly escalate into a nightmare scenario which sometimes leads to tragedy. 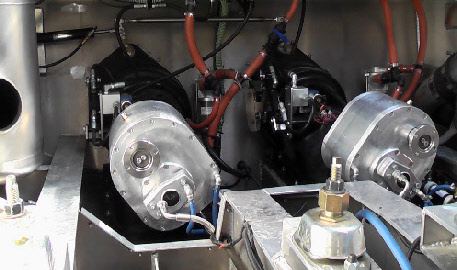 When faced with extreme water conditions, the performance of the hull and the propulsive characteristics of the drive system become paramount. Unlike other propulsive methods Contrapel Hybrid continues to shine. The high mass and low plume velocity combined with a unique “triple vane” steering system situated in the wash, gives the Contrapel Hybrid superior control at all speeds. There is no need for expensive and complex controls. Turn the wheel and the boat goes where you want, even rotating around its own axis when off the plane. Contrapel’s fully enclosed and protected hybrid propellers make operating around rocks, in shallows and near unseen submerged logs a much less risky prospect. In extremely heavy sea states where slow-speed control is vital, the performance is stunning. The ability to accelerate rapidly, or retain forward thrust with virtually no throttle while still maintaining steerage, gives the captain increased confidence. Additional benefits over high-speed water-jets includes high tolerance to wear caused by small particles in the water. Compared with all high-speed water-jets and propellers, expensive maintenance is considerably less. Water-jets rapidly lose performance even with small amounts of impeller damage or wear, which increases the clearance between the impeller tips and the pump housing. This results in a reduction in the jet’s ability to generate the required pressure. In contrast, the tip clearance within the Contrapel hybrid unit is not a critical design parameter. Being able to operate with very large clearances allows particulates to pass by without grinding the outer blade edges and the pump housing. This means that performance loss due to damage or wear is greatly reduced. The rotating speeds of the hybrid propellers are also very low, which generates low noise and little wake turbulence. The Contrapel Hybrid boasts “propeller-like” thrusts at all speeds, but unlike propellers the Contrapel Hybrid propellers are enclosed in a stainless steel tube that is screened to ensure objects cannot be ingested. This means that animal life, people and fragile seascapes are protected from damage. Propeller strike resulting in disfiguring scars and even death will become a distant memory consigned to our dangerous past. In addition there is very little torsion effect or vibration transmitted to the boat, as the counter-rotating effect helps balance out the forces.